When you’re designing a kitchen, every piece is part of a large puzzle. If you choose the wrong piece, the puzzle won’t fit together. 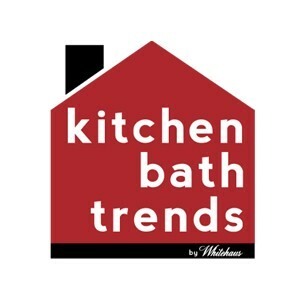 There are a variety of pieces that go into a kitchen design: sink, counter, floor, cabinet and appliances. 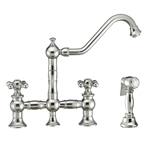 Choosing the right faucet finish is just as important as choosing the right sink, counter or cabinet material. In past years, the faucet was considered just part of the sink; a mere extension of a fixture rather than its own design concept. Choosing the finish was easy because it just had to match the sink. Recently, designers have started viewing the faucet as a separate piece with its own design presence, rather than an annex of the sink. 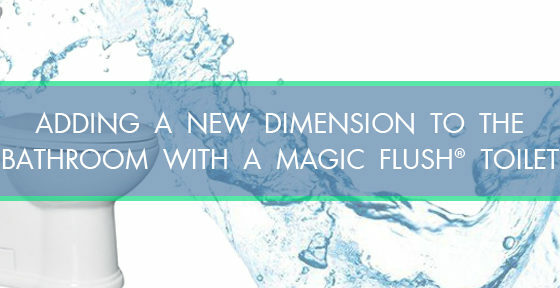 Because of this shift in perspective, faucet finishes now can be different than the sink finish. Mixing and matching them enhances the style of your kitchen, especially if your style is transitional. 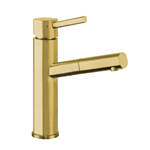 Whitehaus Collection® offers a wide range of faucet styles available in exquisite finishes, from the popular Polished Chrome, Brushed Stainless Steel, Antique Brass and Oil Rubbed Bronze; to the exclusive ones like Gunmetal, Brass, Copper and Bronze. 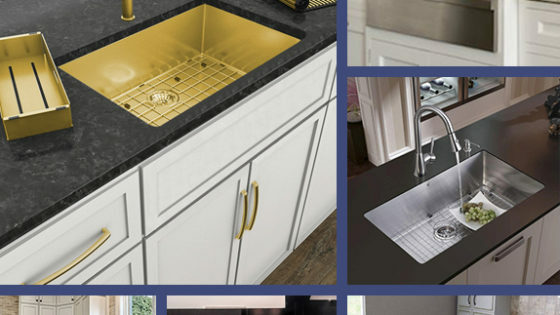 In the following suggested combinations, each finish has been carefully selected in a specific style of kitchen faucet to match and compliment a sink. These combinations look to highlight the unique features of the faucet and make a combined design statement along with the sink. 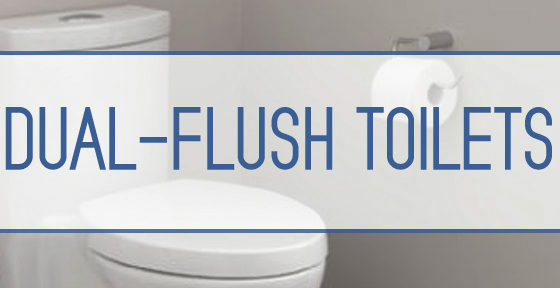 These are only suggestions, so don’t be afraid to get creative—just because we don’t list the finish with the sink doesn’t mean it won’t look good! You also want to take your counter color and material into consideration when choosing your faucet finish. 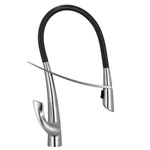 The Polished Chrome faucets fit best into modern and contemporary kitchen styles. They’re sleek and shiny, and will be the eye catching statement you’re looking for. Pair them with stainless steel sinks from the Noah’s Collection, Noah Plus Collection and also with Vitreous China sinks. Brushed Stainless Steel faucets are also look great with modern and contemporary kitchen styles, and their brushed finish gives them the added benefit of being easy to clean. Pair them with Noah’s Collection, Noah Plus Collection and Pearlhaus sinks for an impressive look. 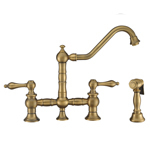 The faucets in the gracefully aged Antique Brass finish are ideal for a traditional or vintage kitchen. They’re beautifully crafted and will bring warmth into your kitchen. They complement well with Farmhaus Fireclay. 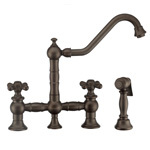 The Oil Rubbed Bronze faucets have a hint of aged black color over the dark bronze base as opposed to touches of brown. They fit Vintage, Tuscan or Old World kitchen styles and complement Farmhaus Fireclay. 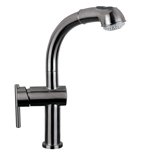 A few of our faucet collections are also offered in a lighter version of this finish: Oil Rubbed Bronze Highlight. This finish is the same as Oil Rubbed Bronze, but has flecks of copper added to it. Our impressive Gunmetal finish is a darker gray with cool undertones and brushed quality. These faucets can fit almost every style. You can add it to a modern, sleek and contemporary kitchen as an statement piece to enhance the kitchen design, or combine it with strong metal sink for a kitchen of industrial inspiration. Pair them with Noah’s Collection and Noah Plus Collection, Pearlhaus or Vitreous China sinks for a cohesive look. The high shine of out Brass finish brings in a pop of color as well as class to any kitchen style. An eclectic style would benefit from this out of the ordinary color, but so would a more refined, glamorous kitchen in darker, jewel tones. Matches perfectly with the sinks from the Noah Plus Collection. 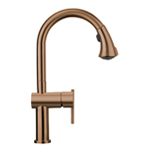 Copper faucets are eye catching and bold, easily becoming the statement focal point of your kitchen. When placed in a transitional kitchen, they will become the highlight that will tie it all together. Sleek, modern kitchens with a fun twist would also benefit with its color presence. Perfect combination for the Noah Plus Collection sinks.